After stops in Colorado and California, the Western Swing concludes at scenic Pacific Raceways. One of the tour’s most breathtaking environments, the facility is parked in the shadow of majestic Mount Rainier and surrounded by towering trees that add more than beauty: They emit tons of power-enhancing oxygen to feed the appetites of the high-horsepower machines, resulting in prime performances. Tickets can be purchased online by clicking the TICKETS button above or by calling 253-639-5927. Purchase early and save! How to Get There: The track is 10 miles east of Interstate 5 on Highway 18. From I-5, use Exit 142A (Auburn exit) and travel east 10 miles on Highway 18, following the signs to the track. From other points, use Highway 18 and exit S.E. 304th Street. Manufacturers Midway - Come check out your favorite displays in Nitro Alley from 10:30 A.M. until the beginning of the second Nitro qualifying session. Toyota Autograph Session - At the Toyota Midway Display featuring all of your NHRA Toyota Drivers - 12:30 P.M. - 1:00 P.M.
Nitro Qualifying - Catch the action of two sessions of 300 MPH Nitro qualifying - 3:00 P.M. & 5:30 P.M.
Nitro School – Come join Alan Reinhart and Del Worsham at the NHRA Midway Display and get schooled on all your Nitro knowledge - 11:30 A.M.
Toyota Autograph Session - At the Toyota Midway Display featuring all of your NHRA Toyota Drivers - 11:30 A.M. - 12:00 P.M.
Mello Yello Autograph Session - At the Mello Yello display featuring Tony Schumacher, JR Todd, Doug Kalitta and Allen Johnson - 12:00 P.M.
Sealmaster Trackwalk - Join us in walking the track at Pacific Raceways with a few of our special guests. 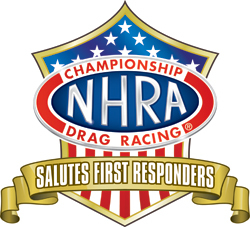 As part of the tribute, first responders will be eligible for discounted tickets to the NHRA Northwest Nationals through GovX. Click here to purchase.